Recently, I noticed that I could see arrows coming out of my bow appearing to fly crooked. This is not ideal, because fishtailing arrows don’t fly straight, group poorly, and don’t fly as far as arrows that fly straight. So I decided to take some time to check and adjust the tune of my bow. With all that fresh in my head, I decided to write down my thoughts and process for how I tune for Barebow. What are the levers of control? This varies somewhat depending on your equipment choices. Some bows are not tunable at all, so the only levers are the arrows and brace height. In my case, I know that my arrows are what I want, and my bow (and most any bow designed for Barebow shooting) is highly tunable; maybe a bit more tunable then typical, but not unusually so. For our purposes here, we’ll assume the arrows are within reason and all our tuning will be done to the bow. If you have a simple plastic (or springy offset) arrow rest, there is nothing you can do there, but the trend these days, even among “trad” archers, is to use a plunger and wire rest. These will need to be set up properly. The string is also involved in your bow’s tune. There are a couple of things you can tweak on a string: the brace height, the nock locator position, and the strand count. Normally, only the nock locator position is tuned, but yes, the strand count of a string can impact arrow tune. Bear that in mind when replacing a string. The arrows themselves are also something you have control over. You can select arrow spine (stiffness), point weight, fletching, and nock weight. In the Barebow world, we generally choose arrow specifications to get us close to proper tune, then tune the bow to match the arrow. For the purposes of this post, I’m going to start with the assumption that the arrows are “close enough” and match the bow to the arrow. If that assumption proves false, we’ll know at that point how our arrows will need to be different. Nothing else matters if the arrow rest and plunger are not set up to a good starting point. Here are two examples of arrow rests/plungers. For both of these bows, the plunger and rest can both be adjusted, and we will be checking them both. 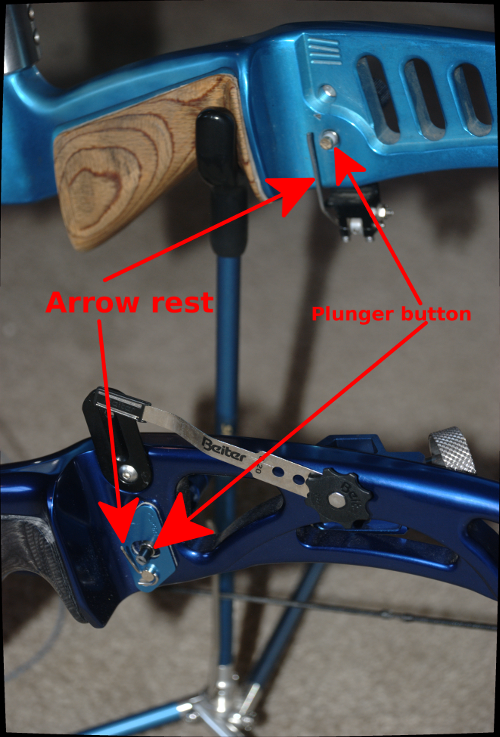 The plunger can be adjusted in and out from the riser, thus holding the arrow the correct distance from the riser. If the arrow is too close to the riser, it (or the fletching) may hit the riser on the way out, and if too far, the string will be pushing the arrow sideways. Once a plungers is set, the arrow rest can be adjusted to hold the arrow just enough, but not too much. The arrow rest needs to be the right height, or the arrow may slip past the plunger, and must be the right depth so that there is enough rest to hold the arrow, but not so much that it interferes with the arrow as it leaves the bow. I’m going to concentrate on top bow, because that is the Barebow that I’m tuning. The bottom bow is an Olympic style bow I’m using as an example. This picture shows the bow set up and mounted so that it is easy to see how the plunger depth is set. The idea is to move the plunger in or out until the point of the arrow appears to be just left of the string when looking through the string the direction that the arrow will be shot. In this picture, I’ve mounted the bow in a jig so that I can look carefully. The blue blur is the bow string. Note how I visually centered it on the riser, then I look down the arrow shaft. In the picture, you can see that the shaft, at the point, is just left of the string. (If you are setting up a left-handed bow, put the arrow on the right side of the string.) How you move the plunger button in or out depends on the brand of plunger you are using, but it is generally pretty obvious. This setup is pretty fiddly because it is sometimes hard to see the string and arrow shaft. What I find works best is to mount the bow in a vise or a jig, then nock the arrow and look at the string with one eye. After setting the plunger depth, the arrow rest is next up. This next step presumes that you are using an adjustable wire rest. 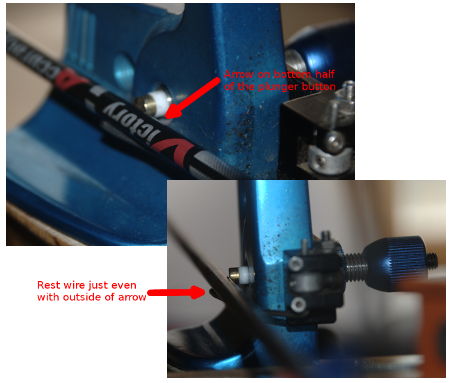 If you are at the level where you care about tuning your Barebow (and are therefore reading this) then you should be using an adjustable wire rest. It doesn’t need to be super fancy, but it should be minimally tunable. Adjusting the arrow rest may take some patience, and bending of wires, depending on the brand and model of rest that you use. In my case, I have a Spigarelli rest, which is pretty darn adjustable, but the goal is the same with any adjustable rest. Set the elevation so that the arrow touches the plunger button on the bottom half of the button face, and set the wire span so that it is just barely enough to hold the arrow. The outside edge of the arrow shaft should be roughly even with the end of the wire. We want the shaft to be below the center of the button face, because on release it will bounce up a bit; if it is too high, it will slip off the plunger. It won’t bounce down much because, well, the wire is there to stop it. We want the wire of the rest to be minimally exposed, because any wire sticking out is wasted mass in the way of your fletching. Of course if the arrow keeps falling off, then maybe it’s in too far, but we are grown up archers now and we shouldn’t be pinching arrows any more, so you need very little arrow rest wire. And that should do it for adjusting the plunger button and arrow rest. This should be done with some care, then locked down. You will not need to touch these adjustments unless you get new (longer/shorter/wider/thinner) arrows, a new rest, whatever. We will not be fiddling with these as part of the tuning unless something is going really wrong. It’s worth checking these settings periodically to make sure they do not drift, but beyond that, this part is done. This is still a subject I’m learning about myself, so I don’t have a whole lot to say here. But you do want to set it to a reasonable value and make sure it stays. I set my Barebow to have 1/8” positive tiller, and just make sure it stays there while doing other things with the limbs. This alone can have a profound effect on the flight of your arrow, so much so that you must get it right. My favorite method of tuning the nock locator is paper tuning. You can get it right on and check it with all the crawls you use quickly and easily. Yes, string-walkers, your crawls can have an impact on your nock locator tune, although I’ve found that the impact is pretty minor. Still, it’s prudent to check your tune with long and short crawls to make sure. Let’s get started. 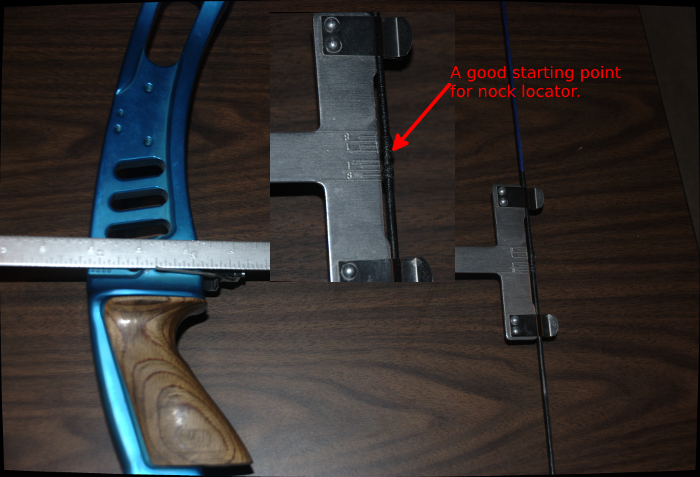 Next, I use the paper tuning jig to pin down the best place for the nock locator. The idea is to have the arrow leave the bow level: not nock high, or nock low. An easy and accurate way to see that is to shoot through a piece of paper held up by a frame. Stand back about 3-5 yards from the paper, then shoot an arrow through. If the nock locator is too high, the arrow will leave the bow, and hit the paper, a bit tail-high. This will leave a tear in the paper. You will be able to tell from the rip where the point entered, and where the fletching passed through. (The Easton Arrow Tuning and Maintenance Guide is a great help here.) You are at this point after either a single bullet hole, or more likely at this point a perfectly horizontal rip. (We will address the horizontal rip later.) If the tail of the rip is higher then the point, then lower the nock locator, if the tail is lower, then raise the nock locator. Shoot at least two arrows per test to show that you are getting consistent results, and double check with your most extreme crawls to be sure that the tune is good for all distances. Once you get your nock locator position tuned, add a second locator below the arrow so that the arrow doesn’t slide around while string walking. This is a good time to tie on the locator in place of the brass locator, since you are not going to be changing this any more. 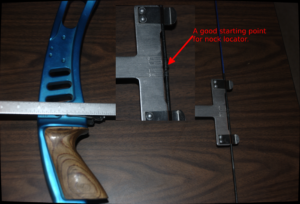 Lock it in so you are sure it stays, measure the position with your bow square, and write it down for future reference. This next part is black magic. Everyone finds it mysterious: the dynamics we are trying to account for are complicated, squirrelly, and can depend on many things. An important point to note here is that your release has a huge impact on the flight of the arrow, so you are not going to be able to tune the arrow any better then you can shoot it. Whenever you release the string, your fingers will impart some side-to-side motion to the string, which will in turn wiggle the arrow while it pushes it. Good quality limbs may help here, but ultimately, a clean release is a must. So when you are tuning your arrow spine, always shoot multiple arrows to get average results, and don’t try to tune any more then the margin of error in your tests. Back at the paper tuning setup, we again start shooting arrows through the paper. This time, though, we are looking for horizontal rips in the paper. They should he horizontal at this point, assuming you’ve done a good job with nock locator tuning. We looking for indication whether the arrow is flying out of the bow tail-left or tail-right. 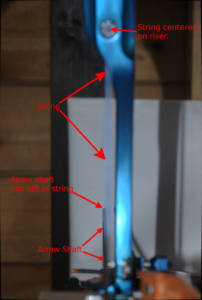 You will be able to tell by looking for the rip that the fletching makes in the paper, and we will adjust the limb bolts to match the bow to your arrows. If you are right handed, and the arrow is stiff, then the arrow will leave the bow tail-right. (If you are left-handed, the arrow will be tail-left.) You can fix this situation by tightening your limb bolts. Try a ½ or a full turn in, then try again. Always make sure your tiller remains the same while you are doing this. You should see the rip get smaller. Repeat until the rip is no longer horizontal. If you run out of travel for the limb bolts, then the arrow is too stiff for your limbs. When this happens, something will have to change with your arrows. You can: a) get new shafts or longer shafts, b) install heavier points, or c) get heavier limbs. If you are right handed and the arrow is weak, then the arrow will leave the bow tail-left. (If you are left handed, the arrow will be tail-right.) You can fix this situation by loosening you limb bolts. Agail, try ½ to a full turn at a time. Always make sure your tiller remains the same, and also make sure you don’t run out of travel in your limb bolts. Unscrewing your limbs would be bad! If you do run out of travel, then you arrows are just too weak. You can try installing lighter points, or a heavier nock/insert, or you can try shortening your arrows. The end result of this step will ideally be “bullet holes” in the paper. This is hard to achieve in practice, so be ready to accept a little bit of horizontal rip. If you get to a point where the limb bolt adjustment is not helping anymore, then you might as well be done. Release quality and other shooting form issues are now dominant, so work on that instead. At this point, assuming you’ve done all of the above, then the bow and arrow (and archer) combination should be reasonably well in tune. Make sure set screws are snug, and go shoot for a while. In a day or so, revisit the paper tuning rig to see if anything has changed. If not, then great. If it has, then you have to ask yourself if your equipment drifted or if you are changing something. Inconsistent draw, plucking release, etc., can all look like changing arrow tune. Before chasing your tune, try to make sure you are consistent. Check it again on another day. Still off the same way, then OK do a little tuning. If not, then get your shooting form locked down better. Well, that last bit of advice is always good.